Whattya Mean You're Not Blogging Yet? You call yourself an affiliate marketer but you're not a blogger? You don't even need your own domain if you use a service like Blogger.com. A free Blogger.com blog is a good option if the thought of having your own domain and building your own web site is an obstacle to getting you started in your own online business. Of course, I still stick by my recommendation that every affiliate SHOULD have their own domain for the sake of creating a businesslike and professional appearance. Honestly, nothing is easier to set up than a blog, especially if you decide to install WordPress on a Bluehost account. One click, a couple of text blank entries and you're ready to blog! Best of all, blogs are the fastest way to get free traffic known to Internet-Marketing-kind. So, have I got your attention yet? If you read the NPT Blog, you've probably noticed that I post more frequently now than when I started my blog. First, blog posts are generally more informal and conversational than a newsletter which tends to be more structured. That makes a blog easier to write, and easy is good. Secondly, a blog is super simple to manage. You don't have to create individual HTML pages or uploading files to your server. Just write your message, click ‘Publish' and your message is posted and available for all the world to read. That means when I learn something of interest to NPT visitors and newsletter subscribers, I don't have to wait until NPT Newsletter Tuesday to tell them about it. I just blog it immediately. So, for example, if you get some promotional copy with your links embedded from your affiliate manager, you could simply login to your blog, cut and paste the material, and Voila! there it is! You could do that… but I suggest you change the wording and create an original post in your own style. Lastly, I've discovered that the free traffic coming to my blog is phenomenal. The more I post, the more traffic I get. If you look at the ‘Archives' for the NPT Blog you'll see the first entry was made in November 2004. Confession… I didn't really start bloggin until February 2005. I just posted some previous newsletters and changed the timestamp to reflect their original publishing date. 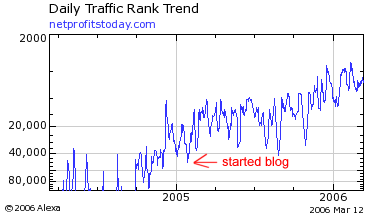 At the time I started my blog, RosalindGardner.com had an Alexa ranking of somewhere around 60,000 as shown in the graphic below. And I've seen it go as high as 2,827 as shown in the image captured on Aug 16th, 2005. By allowing comments to be posted to your blog, you build community, which makes your site still more interesting for visitors. And when the site is more interesting, people stick around longer. Something that encourages even more traffic are the RSS-to-Email “Blog Alerts” that allow folks to subscribe to receive my blog posts via email, instead of using a feed or news reader. “Convert RSS to Email Newsletters Automatically” to show you how easy it is to set up. Actually, I've found response to the NPT Blog so successful that I recently started blogging at my online dating review site, 101Date.com as well. (Interested? Please let me know through our Support Desk). To sum things up… Blogging is fun, it drives free traffic and it PAYS. What could be better than that? I’ve had my site at http://www.DynamicResponseMarketing.com up for a while now. I’ve hired a tech person for design changes, managing Adwords, etc. We decided to move into SEO and began to realize the power of blogging. I wasn’t sure if I really wanted “to do it” but your article put me over the edge. We’ll have the blog up and running in about a week. That’s great news. I know you’ll be surprised and delighted by the fantastic results! I’ve just started my internet business, I don’t have my own website yet, but I have joined a couple of affiliate programs and I’ve also been recieving training from internet marketing experts, such as Rosalind Gardner, Terry Dean and others. I’ve been blogging my site and it’s really helped me gain experience as well as provided me with some extra business. Thank You Rosalind for your advice about blogging. My pleasure to be of help! Keep up the good work! I use blogger I may switch to wordpress at somepoint but right I’m having fun with blogger. LOL My alex ranking is 4.5 million, woo hoo I’m in the top 5 million. When I first started I use Blogger but noticed that some places I access internet have blocked access to Blogger.com. So I decided to go with WordPress. Like you mentioned, WordPress is a very easy to use blogging program. You can find lot of plug-ins also. Though my site traffic is not as much as yours, 🙂 I also noticed good traffic coming to my site. My site had an Alexa ranking of 1.5 million+ but now around 400k. I haven’t even blogging for more than 1 month. From 1.5 million to 400k in a month… that’s simply fabulous! Keep up the great work and Happy Blogging!